Honda Motorcycle & Scooter India Pvt. Ltd. (HMSI) – the only two-wheeler company of Honda in India, today unleashed a ‘Fun Motorcycle revolution’ here introducing 5 new models panning all segments at the Honda RevFest 2015 conducted today. The Honda RevFest 2015, held simultaneously across 8 centers – New Delhi, Mumbai, Bangalore, Hyderabad, Chennai, Kolkata, Indore and Ahmedabad has created huge frenzy among motorcycle enthusiasts all over the country. With more than 7.7 lakh page views, more than 25000 lucky participants had registered to be a part of this event. While another 10 million viewers tuned in through the webcast witnessed history unfold at the Honda RevFest 2015. 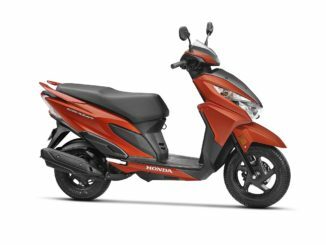 Honda’s 650cc middle weight sports model, first of Honda’s premium ‘Make-in-India’ tourer motorcycles, features sleek, sporty style, 16 valve DOHC in-line 4 cylinder, 6 gearbox engine; and can be enjoyed for wide range of uses including touring and sports riding. The 649cc 16-valve inline 4 cylinder engine delivers smooth and easy performance even at an rpm as low as 4000. The impeccable engine is best tuned to churn out max 64kW@ 11000 rpm. Programmed Fuel Injection (PGM-FI) operates with information from 4 separate throttle body sensors on 32mm throttle bores for crisp & accurate throttle response. The Double Overhead Camshaft (DOHC) provides precise power & pick up in line with Honda’s 60 years of pure racing legacy. The 16 valves are placed in V-shape in DOHC layout. This provides space to place the spark plug right in the middle at the top of piston which improves combustion. The strong yet lightweight frame easily accommodates all engine parts to maintain that desired compactness. The steel frame provides comfort against bad roads in everyday street riding. CBR 650F comes with Honda Ignition Security System (H.I.S.S) – a proprietary electronic anti-theft device that automatically disables engine starting by means of electronic control. The moment rider removes the ignition key – H.I.S.S. switches-on; providing an effective amulet to ward off theft. The well-articulated meter is styled to accentuate the sports look of CBR 650F. It displays crystal clear information on the go with major highlights – Digital Speedometer, Digital Bar Tachometer, Dual Trip Meter, Digital Bar Fuel Gauge and a Digital Clock. The Honda Racing Corporation (HRC) inspired racing Red, White and Blue tri-color paint provides a finishing flourish. Ultra-premium headlight of CBR 650F has aggressive appeal which sits perfectly on the beast. Its white LED position lamps outline the headlamp elegantly. All CBR 650F parts are shaped to perfection. Precise LED tail light and winkers give majestic look at the rear. A real sports bike never settles with anything skinny. It needs mass. CBR 650F has 180mm wide tyre at rear which leaves behind all bikes in its class. Epitomizing advance technology– the 320mm double disc brakes in front and 240mm hydraulic disc at the rear, complements the twin front discs and the ABS which comes as a standard fitment for plenty of stopping power. Clip-On handle bars adds sportiness to the bike’s character. In CBR650F, the handle bars help rider lean more on the bike & distribute overall body weight which enhances steering ability… easily cutting the traffic to make way! The mono shock maintains the center of mass. It lets the street sports thrill never go out of your mind. The single point absorber, makes high speed turns go without fear. It also offers 7-stage spring preload adjustment and operates directly on the swing arm. Short & sporty muffler compliments CBR 650F sports design appeal. The perfectly crafted exhaust maintains the mass centralization. Further, the evocative right side-swept 4-2-1 exhaust (optimizes exhaust gas flow and decreases turbulence) makes your beast give the perfect growl! Smooth, nearly seamless shifts and more gear ratios match the way rider wants to ride. In fact, these are two of the many characteristics that make this Honda so much fun to ride. Coolant flow path in CBR 650F is configured in accordance with the compactness of engine. Internal liquid channeling from cylinder head to cylinders does away with a great deal of exterior hoses (normally required) and a proper operating temperature is maintained for ultimate performance. To provide a premium experience of world-class standards to discerning CBR 650F customers, Honda has invested in exclusive sales-service network of elite ‘Wing World’ dealerships across 12 cities in addition to the 2 existing Wing World showrooms. Exceeding customer expectations, Honda CBR 650F is priced at Rs. 760,970 (Ex-Showroom Mumbai). Honda also ushered in the ‘Time To Live’, launching the new 110cc LIVO, ready to excite the aspirational first time bikers. Powered by the proven 110cc 4-stroke advanced Honda engine that comes with magnificent enhancements, thanks to Honda Eco Technology (HET), the new LIVO is a fusion of advance design and practicality. With its latest offering, Honda is set to reignite its relationship with India’s youth, comprising of students, executives and young entrepreneurs. The new LIVO comes in 4 stunning colors – Athletic Blue Metallic, Pearl Amazing White, Sunset Brown Metallic & Black; and is available for sale in two variants Self-Drum-Alloy and Self-Disc-Alloy. Representing good value for money that exceeds the Customer’s expectation, the new LIVO is attractively priced, at Rs.57,090 for Self-Drum-Alloy; and Rs.59,590 for Self-Disc-Alloy (Ex-showroom, Mumbai). Customer’s trust is the testimony for the success of CBR 250R in India. It has always been the preferred choice when it comes to unmatched capability and riding comfort. The new look CBR 250R with sporty graphics and exciting colors are set to leave the audience spell bound. Ever since it debuted in 2012, the CBR 150R has always been the heart throb of the young Indian enthusiast. The New CBR 150R with attractive graphics and new exciting colors will cater to the dynamically changing need considerations of the target group. The Youth of today believes in their abilities and challenging the old notions. This “golden generation” is go-getter and chase what they want. Honda shared the teaser of a new ‘mystery-product’, amplifying the excitement amongst the Indian motorcycling community. Scheduled to be launched later this year, the ‘mystery product’ rounds-off Honda’s promise of delivering 15 new models in 2015. Extending its international association to India, Honda today announced that it has entered into a partnership with premium Italian denim brand GAS. As the official style partner, GAS showcased its Autumn/Winter 2015-16 collection at the Revfest platform in 3 cities (Delhi, Mumbai & Bangalore) through a slick fashion-show which culminated with Honda brand Ambassador and Action King of Bollywood – Akshay Kumar making a show-stopper presence at the end. This launch partnership between GAS and Honda is just the first step to a long term relationship in India. Now motorsports fans in India will finally be able to wear their passion for motorsports! GAS will retail a special limited edition of GAS – Honda motor-biking clothing and accessories at the 14 exclusive Wing World outlets across India. All GAS stand-alone stores will also have a dedicated showcase area to display the limited edition Honda-GAS biking capsule collection. Globally, GAS has been the exclusive fashion sponsor of Honda MotoGP teams since 1998. Champions on the circuit and in life, like Mick Doohan, Nicky Hayden, Andrea Dovizioso, Casey Stoner, to nowadays Dani Pedrosa and Marc Márquez have created history with Honda ultimate racing machines with GAS on their sleeves. Since 1984, Grotto S.p.A. designs, produces and distributes collections of clothing, footwear and accessories under GAS brand. GAS was launched in early 70s out of the passion and creativity of Claudio Grotto, the company’s President and Founder, in Chiuppano (Vicenza), in Italy. GAS is a premium aspirational denim lifestyle brand meeting the needs of intelligent, aware, international, cosmopolitan consumer. Today, Grotto S.p.A. is a global giant, determined to further expand its presence abroad, particularly in Europe and the Far East. In India, GAS is present since 2007 and has partnered with Reliance Brands Limited (part of Reliance Industries Group). It is available at 65 points of sales, including Flagship stores in Delhi and Mumbai and through 3rd party e-commerce platforms like Myntra, Jabong, Amazon and Flipkart. Honda two wheelers grow over 2 times faster than industry-Total sales grow 19% to reach 436,358 units in May, 2016.